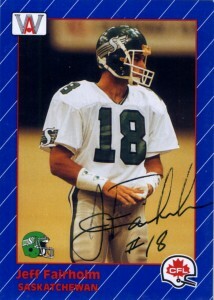 A 2005 Saskatchewan Roughriders Plaza of Honor inductee who played collegiately at Arizona, Jeff Fairholm was the Rookie of the Year in 1988 of the CFL Western Division, recording 45 catches that season. Considered a non-import because he was originally from Canada and played high school there, Fairholm would team up with Ray Elgaard and lead the team to the Grey Cup Championship in 1989 (with another 45 receptions). In 1990 Jeff would electrify the league with a franchise record 107 yard touchdown reception, despite limited play from injury; However, the next three seasons would be a testament to Jeff’s ability as he’d rake in 216 receptions and 28 touchdowns. He’d sign with the Argonauts as a free agent in 1994, but was never able to duplicate the numbers he had in those final 3 seasons for Saskatchewan. Solid slot receiver play from Fairholm helped him play in the league until he won another championship in 1996 with the Toronto Argonauts, where he later coached wide receivers. Since his coaching days Jeff has diversified his interests and also runs an internet corporation in the Montreal area.